Today I am starting a new series where I’ll be swatching various makeup products on a white paper.. I am calling it the ‘Swatch Series’.. Many a times we swatch products on our skin and invariably, it leads to an altered appearance based on individual skin tone.. Hence, I decided to use paper to avoid any influence of my undertone and/or pigmentation in my skin.. I’ll be posting swatches of foundations, blushes, lip products and everything related to makeup! This series will not have in-depth review of the product.. It is just a means for looking at the various color options I have for that particular product on a white background.. This may help individuals in making a more educated choice.. 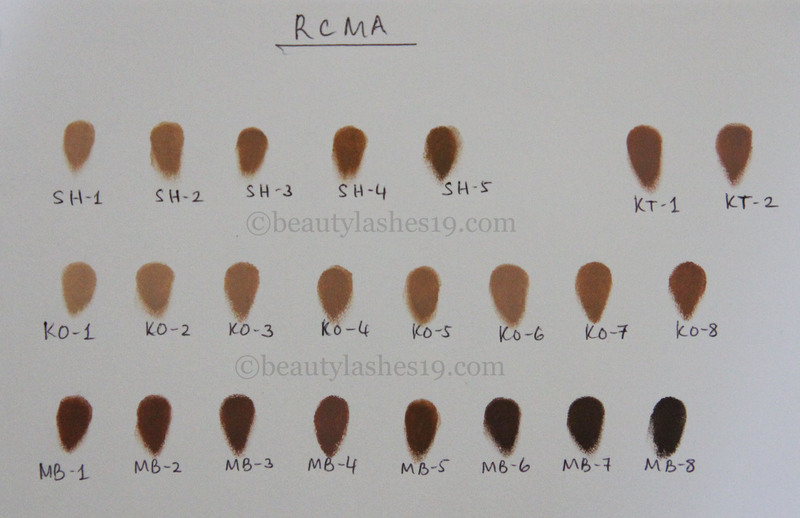 I hope this is helpful.. Feel free to join me in my series..
My first swatch series is dedicated to RCMA cream foundations.. I own the 5 part series favorites palette in the color family ‘Shinto’ and the VK palette 10.. Here are the swatches..
SH series addresses yellow and green undertones.. KT series reflects natural suntan tones such as yellow tan.. KO series are meant as in-between shades of SH series.. However, I do not find them to be in between shades.. There’s quite a wide range there and some shades in this range are quite light.. MB series are a set of deeper shades..
SH-1 to SH-4 have ochre undertones, rising in very small increments of color depth . For reference, I am close to an NC40 in MAC foundations and I use Shinto shades 1, 2 & 3.. With or without a sunscreen, I use SH-1 predominantly and a bit of SH-2 on the darker parts of my face.. On days that I use a tinted moisturizer/foundation, I tend to use SH-2 predominantly and a bit of SH-3 on the darker parts of my face (corners of mouth).. Note: All my tinted moisturizers and foundations are darker than the skin tone on my face since my neck is darker than my face and I like to match my neck..
Hey Julia! For your skin tone, I would recommend the Shinto series over the KO ones. I use the palette for pretty much most base application- foundation, concealer, highlight and contouring.. If you would like to try them first, I would suggest getting the 5- series one for Shinto and see how you like that before buying the VK palette..
For application, I prefer applying a small amount on the back of the hand with a spatula.. I then like to warm it up with my fingers and then use either a brush or my fingers depending on the finish and coverage I want that day.. Sponge might absorb too much of the cream product.. For primers, I would just base it off of your skin type..